But I would wager that, more often that not, y is not directly a function of x . Rather, y may be affected by a host of direct and indirect factors, which themselves affect one another directly and indirectly. If only there was someway to translate this network of interacting factors into a statistical framework to better and more realistically understand nature. Oh wait, structural equation modeling. [Updated March 10, 2016: You can find more materials relating to SEM, including lectures, example analyses, and R code here: https://jonlefcheck.net/teaching/]. What is structural equation modeling? Structural equation modeling, or SEM for short, is a statistical framework that, ‘unites two or more structural models to model multivariate relationships,’ in the words of Jim Grace. Here, multivariate relationships refers to the sum of direct and indirect interactions among variables. In practice, it essentially strings together a series of linear relationships. Which is described by the equation: Y ~ X1 + X2. Which is now described by two equations: X2 ~ X1 and Y ~ X2. These two equations make up the SEM. (1) As I pointed out, I’m talking about linear relationships. There are ways to integrate non-linear relationships into SEM (see Cardinale et al. 2009 for an excellent example), but for the most part, we’re dealing with straight lines. (2) Second, we assume that the relationships above are causal. By causal, I mean that we have structured our models such that we assume X1 directly affects Y , and not the other way around. This is a big leap from more traditional statistics where we the phrase ‘correlation does not imply causation’ is drilled into our brains. The reason we can infer causative relationships has to do with the underlying philosophy of SEM. SEM is designed principally to test competing hypotheses about complex relationships. In other words, I might hypothesize that Y is directly influenced by both X1 and X2 , as in the first example above. Alternately, I might suspect that X1 indirectly affects Y through X2 . I might have arrived at these hypotheses through prior experimentation or expert knowledge of the system, or I may have derived them from theory (which itself is supported, in most cases, by experimentation and expert knowledge). Either way, I have mathematically specified a series of causal assumptions in a causal model (e.g., Y ~ X1 + X2 ) which I can then test with data. Path significance, the goodness-of-fit, and the magnitude of the relationships all then have some bearing on which logical statements can be extracted from the test: X1 does not directly affect Y , etc. For more information on the debate over causation in SEMs, see chapters by Judea Pearl and Kenneth Bollen. 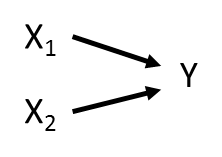 (3) Third, in the second example, we have not estimated a direct effect of X1 on Y (i.e., there is no arrow from X1 to Y , as in the first example). We can, however, estimate the indirect effect as the product of the effect of X1 on X2 and the effect of X2 on Y . Thus, by constructing a causal model, we can identify both direct and indirect effects simultaneously, which could be tremendously useful in quantifying cascading effects. Traditional SEM attempts to reproduce the entire variance-covariance matrix among all variables, given the specified model. The discrepancy between the observed and predicted matrices defines the model’s goodness-of-fit. Parameter estimates are derived that minimize this discrepancy, typically using something like maximum likelihood. There are, however, a few shortcomings to traditional SEM. First, it assumes that all variables are derived from a normal distribution. Finally, traditional SEM requires quite a large sample size: at least (at least!) 5 samples per estimated parameter, but preferably 10 or more. This issue can be particularly problematic if variables are nested, where the sample size is limited to the use of variables at the highest level of the hierarchy. Such an approach drastically reduces the power of any analysis, not to mention the heartbreak of collapsing painstakingly collected data. These violations are dealt with regularly by, for instance, fitting generalized linear models to a range of different distributions. We account for hierarchy by nesting variables in a mixed model framework, which also alleviates issues of sample size. However, these techniques are not amenable to traditional SEM. These limitations have led to the development of an alternative kind of SEM called piecewise structural equation modeling. Here, paths are estimated in individual models, and then pieced together to construct the causal model. Piecewise SEM is actually a better gateway into SEM because it essentially is running a series of linear models, and ecologists know linear models. Piecewise SEM is a more flexible and potentially more powerful technique for the reasons outlined above, but it comes with its own set of restrictions. First, estimating goodness-of-fit and comparing models is not straightforward. In traditional SEM, we can easily derived a chi-squared statistic that describes the degree of agreement among the observed and predicted variance-covariance matrices. We can’t do that here, because we’re estimating a separate variance-covariance matrix for each piecewise model. Enter Bill Shipley, who derived two criteria of model fit for piecewise SEM. The first is his test of d-separation. In essence, this test asks whether any paths are missing from the model, and whether the model would be improved with the inclusion of the missing path(s). To understand this better, we must first define a few terms. X1 is causally independent of Y2 because no arrow exists between them. However, X1 indirectly influences Y2 via Y1 . Thus, X1 is causally independent of Y2 conditional on Y1 . This is an important distinction, because it has implications for the way in which we test whether the missing arrow between X1 and Y2 is important. A test of directional separation (d-sep) asks whether the causally independent paths are significant while statistically controlling for variables on which these paths are conditional. To begin, one must list all the pairs of variables with no arrows between them, then list all the other variables that are direct causes of either variable in the pair. These pairs of independence claims, and their conditional variables, forms the basis set. which follows a chi-squared distribution with 2k degrees of freedom (where k = the number of pairs in the basis set). Thus, if a chi-squared tests is run on the C statistic and P < 0.05, then the model is not a good fit. In other words, one or more of the missing paths contains some useful information. Conversely, if P > 0.05, then the model represents the data well, and no paths are missing. The formula should look quite familiar if you’ve ever calculated an AIC. In this case, the gobbledy gook in brackets is simply C, above. In this case, however, K is not the number of pairs in the basis set (that’s little k, not big K). Rather, K the number of parameters estimated across all models. The additive term can be modified to provide an estimate of AIC corrected for small sample size (AICc). Happily for our purposes, Shipley has provided the raw data as a supplement, so we construct, test, and evaluate this SEM. In fact, I’ve written a function that takes a list of models, performs tests of d-sep, and calculates a chi-squared statistic and an AIC value for the entire model. The function alleviates some of the frustration with having to derive the basis set–an exercise at which I have never reliably performed–and then craft each model individually, which can be cumbersome with many variables and missing paths. You can find the most up to date version of the function on GitHub. which reveals that C = 11.54 and P = 0.48, implying that this model is a good fit to the data. If we wanted to compare the model, the AIC score is 49.54 and the AICc is 50.08. *These values differ from those reported in Shipley (2009) as the result of updates to the R packages for mixed models, and the fact that he did not technically correctly model survivorship as a binomial outcome, as that functionality is not implemented in the nlme package. I use the lmerTest package at it returns p-values for merMod objects based on the oft-debated Satterthwaite approximation popular in SAS, but not in R.
There are a few drawbacks to a piecewise approach. First, the entire issue of whether p-values can be meaningfully calculated for mixed models rears its ugly head once again (see famous post by Doug Bates here). Second, piecewise SEM cannot handle latent variables, which are variables that represent an unmeasured variable that is informed by measured variables (akin to using PCA to collapse environmental data, and using the first axis to represent the ‘environment’). Third, we cannot accurately test for d-separation in models with feedbacks (e.g., A -> B -> C -> A). Finally, I have run into issues where tests of d-separation cannot be run because the model is ‘fully identified,’ aka there are no missing paths. In such a model, all variables are causally dependent. One can, however, calculate an AIC value for these models. Ultimately, I find SEM to be a uniquely powerful tool for thinking about, testing, and predicting complex natural systems. Piecewise SEM is a gentle introduction since most ecologists are familiar with constructing generalized linear models and basic mixed effects models. Please also let me know if anything I’ve written here is erroneous (including the code on GitHub!). These are complex topics, and I don’t claim to be any kind of expert! I’m afraid I’ve also only scratched the surface. For an excellent introductory resource to SEM, see Jarrett Byrnes’ SEM course website–and take the course if you ever get a chance, its fantastic! I hope I’ve done this topic sufficient justice to get you interested, and to try it out. Check out the references below and get started. Shipley, Bill. “Confirmatory path analysis in a generalized multilevel context.” Ecology 90.2 (2009): 363-368. Shipley, Bill. “The AIC model selection method applied to path analytic models compared using a d-separation test.” Ecology 94.3 (2013): 560-564. Shipley, Bill. Cause and correlation in biology: a user’s guide to path analysis, structural equations and causal inference. Cambridge University Press, 2002. What is functional diversity, and why do we care? Thanks for this really nice introduction to your recently developed package and piecewise SEM! It’s nice to see more user-friendly approaches being developed for Bill Shipley’s D-sep test. Do you know if it is possible to extend this method to use models such as MRM’s (multiple regression on distance matrices) that are based on permutation tests of significance? And if so, any chance this could be eventually included in the piecewiseSEM package? I am just interested in the outcome of the discussion above: are you aware of a way to include distance matrices (e.g. functional, phylo.) into SEMs, as you can do in MRMs or Mantel tests? Taking principal coordinates (or axes from a PCA) wouldn’t be a solution for me, as I am interested doing an SEM based on distances only. Do you think I should test for missing paths by hand and use the lmer results? I can sent you me code if necessary..
1) Is there a way to work around the need for all the separate linear models using the same dataset? My problem is that this unnecessarily reduces my sample size for some paths. I can use some data points “upstream” and not ‘downstream” if that makes sense. Hi Amos (hopefully not the AMOS program!! ), Happy to assist. (1) I’m not sure I follow. The basis of piecewise SEM is the listed of structured equations, which can be estimated locally, fit to the same dataset. Do you mean that you have hierarchical data such that values of one variable are repeated over unique values of another? (2) I recommend nlme because it has fewer problems with convergence, and therefore greater likelihood of returning P-values with which to construct the d-sep test. Sounds like you have a problem specifying your random structure. Drop me a line and we can get it sorted. ## distribution: keeping response on original scale. I’m a little unclear what this warning means–is it still scaling all models (Gaussian and binomial)? I just want to check that I can compare the path coefficients from this scaled output. Thanks! Thanks for the kind words! The warning is meant to imply that centering and scaling the response would no longer make it binomial- or Poisson-distributed. (i.e., it has gone from 0-1 to something altogether different, or whatever). The d-sep model would then kick back an error saying the variable is not binomially, etc. distributed. There are two ways around this: understanding that the standardized predictors are in units of standard deviations of the mean, so that a 10^1 sd change in predictor X results in a 1 unit change in the predictor (if you were modeling a Poisson variable with a log-link) OR transform the response so that it can be centered and scaled. Make sense? Hope this helps! Thanks, Jon. That helps a lot! I ran into a couple more questions. Can you use semPlot (or is there something equivalent) with piecewiseSEM? I tried it but it didn’t seem to work. Also, “lmer” models (package lme4) give a warning for sem.fit (‘lmerTest did not return p-values. Consider using functions in the nlme package’). Am I restricted to using “lme” models (package nlme)? I have tried to implement semPlot with piecewiseSEM, but it would be difficult. I should contact the package author to see if they would be interested in helping to implement it. As for lmerTest, it has convergence errors more often than not, in my experience. In that case, it doesn’t approximate the ddf and therefore doesn’t return a p-value, which is essentially for the tests of directed separation. In this case, I recommend using nlme since it (more) reliably returns p-values. If you have non-normal variables, you may consider log10-transforming count data. Another option is to use glmmPQL from the MASS package which allows for non-normal data but fits using lme. Let me know if you continue to run into problems and we can try to work something out. Is glmer.nb no longer supported? Many thanks for piecewise SEM. That’s a great ecological tool! I have been working using it. However, when I try to run it with my data I get some errors. #Error in topOrder(amat) : The graph is not acyclic! Why do you think it is going on? I’m trying to use your package to test a SEM model on my data and I got the following message : “Error: Model is recursive. Remove feedback loops!”. Do you have any clue to help me ? I saw that you are working on a ‘helper function to get scaled model for sem.coefs’ in GitHub. What does this do? Does it help get standardized coefficients from glmer models? Thanks! Great package, thank you. I’m having a problem where I can fit a model, but I can’t get sem.coefs or sem.model.fits to work. Oh, so close. Thanks for fixing that for me. It is me again, sorry for bothering you. But, I am kind of stuck in some issues with SEM. First of all thanks for a great package and the nice tutorials, I have really enjoyed them. I have data from a mesocosm experiment, in which I measured a bunch of stuff (chemical, biological, and physical parameters), it is a fully factorial experiment with 5 experimental blocks, so I should use random effects, and that is why piecewise SEM is perfect for me. I want to estimate the magnitude of the direct and indirect effects of my treatments (fish population x density x infection ) at multiple levels (e.g. mesograzers and pelagic algae). 1. Can I use my experimental treatments (main effects and their interactions) as exogenous variables in a piecewise SEM to estimate their direct and indirect effects?. if so, there will be 7 exogenous variables that are uncorrelated. Which bring me to the next question. Writing Shipley’s book 2000, I found a chapter about multigroup SEM, What I understood is that multigroup SEM tests the differences in the covariance of a network of interactions, and test the effects of some treatments. But since, I want to estimate the direct and indirect effect, I am not sure if I should use it. What would think? Strangely I did not get this warning message before…. Thanks for getting in touch. This seems like a great application of SEM because you have indirect, cascading effects (distance & wells -> noise -> lek abundance). Your interpretation is reasonable: not only is the distance of wells from the lek 2x more important than road distance in reducing noise (based on those standardized coefficients), but it is actually the only ‘significant’ contributor (P < 0.001 vs P = 0.06). You can further calculate the indirect effect by multiplying the standardized coefficients: -0.64 * -0.63 = 0.40. Note that the sign changes, implying that increasing distance from wells indirectly increases lek abundance by directly reducing noise. Adding another covariate is possible but keep in mind that the `sem.fit` function will then test for other associations between this variable (X3) and unlinked variables in the model. So ,for instance, if you added it to your first model, the goodness-of-fit tests would include an additional independence claim between `Negbin_tre ~ X3`. This could be good or bad, depending on whether this relationship is significant and changes the fit of your model. thanks so much for this summary. It is really helpful to clarify some points. However, it raises me other doubts that are probably more related with the words that the different authors uses than with the statistics. (SEM) and is based on maximum likelihood techniques. (…) These drawbacks led me to develop an alternative set of methods that can be used for small sample sizes, non-normally distributed data or non-linear functional relationships (Shipley 2000) that I will call these d-sep tests”. Secondly, regarding the evaluating methods, are both d-sep and AIC comparison independent procedures? It seems from Shipley that to compute AIC one needs to perform d-sep procedure. But this seems weird to me. Can I use simply the AIC model comparison to select by best “path model”? or since I need the LogLikelihood for computing AIC the only way is to use d-sep test? Certainly! It may be more helpful to think of the first method in terms of “global estimation,” where relationships for the entire causal network are solved simultaneously (this is what is referred to by Shipley as the “common method”). The d-sep tests are a form of “local estimation” where each path is solved independently from the others. It amounts to simply estimating each (multiple) linear regression by itself. Because each equation is solved individually, each response can be modeled to its own (potentially non-normal) distribution and set of assumptions. This makes the piecewise technique a lot more flexible, as Shipley has argued. As for your second question, the d-sep tests — evaluating the “independence claims” or missing paths in your diagram — provide significance statistics (P-values) that are used to construct the AIC value. So yes, Shipley is correct that, in computing AIC, one must first conduct the d-sep tests. The d-sep tests that produce the Fisher’s C statistic, which is used to infer goodness-of-fit, and the AIC value, which is used to make model comparisons, are two sides of the same coin. One evaluates the independent fit of the model, i.e., does it reproduce the data well, or are there missing relationships that are important given the data? The other is used to compare different topologies. One can use AIC to infer a more likely topology but still have a poor-fitting model, in the same way you can select the most parsimonious regression from a candidate set but it still has low explanatory power (e.g., low R^2). Make sense? 1. C is just the “gobbledygook” in brackets or also the -2ln? if the latter is true, AIC = C+2K, right? 3. And, overall, how your PiecewiseSEM package calculates the LogLikelihood of a path and so the AIC? Using d-sep and C, I guess, am I right? certainly, now I am a little more confused. In your reply above, are you saying that some programs estimate the whole vcov matrix for Piecewise SEM using ML? From this tutorial I understood that this is not possible. Above, in this page I can read that for Piecewise SEM we are “estimating a separate variance-covariance matrix for each piecewise model” (for each single equation of the piecewise SEM, right?). And also, that we are not “reproducing the entire variance-covariance matrix among all variables” as we do in traditional SEM. So, and sorry for the direct question, is it possible or not to estimate a whole vcov matrix for Piecewise SEM? Probably my misunderstanding is because I do not understand very well the difference between local and global estimation, can you recommend me any lecture? Thanks for your work on this great R package. I have a question about effect sizes for pathways in glmer models. One of the strengths of SEM is visually showing the strengths (effect size) of explanatory variables via the size of the arrows in the SEM figure with boxes and arrows. This is great when all response variables have Gaussian distributions because you can compare the strengths of pathways across the entire SEM via standardized coefficients. Is there a way to do this for pathways in generalized linear mixed-effects models (glmer)? My SEM has three response (endogenous) variables – one is binomial and the other two have Poisson distributions. Thus I have three glmer models within the SEM. I have random effects too, to account for the hierarchical design (plots nested in sites) and I’m using the glmer function in lme4. I can’t center and scale the responses. Standardizing the predictors doesn’t quite get me the solution either, I think. How do you recommend I depict the arrows and coefficients in the SEM plot? What is most meaningful and easiest for the reader to understand? I will have the ANOVA table of all the fixed effects – coefficients of non-standardized predictors, standard error and p-values (from sem.coefs). But what/how can I show these best in the SEM figure? One more complication, one of the predictor variables is a binomial variable (the response variable with the binomial distribution, presence/absence). I assume I can’t standardize this as the predictor variable. Hi Jon, thanks for a great package! Can you provide a working example for using sem.fit with glmmadmb within model list? I tried to change glmer function to glmmadmb in the “shipley2009.reduced” data but sem.fit gives this error: unused argument (control = control). If I change “sem.missing.paths” function that sem.fit uses (use admb.opts = control, instead of control = control since it seems that glmmadmb uses this argument in the model formula) I get another error saying that all grouping variables in random effects must be factors (but they are!). So, I got stuck a bit.. Thanks Jon for your great post, I am using piecewise SEM because a have a relatively small data set but I am including some two-way interactions, and I wonder why the scaled estimate for one of the interactions is greater than one. do I have to eliminate the nonsignificative interactions using AIC for model comparison? Thanks for PiecewiseSEM! I had ruled using SEM out, given the nature of my data,until someone mentioned piecewiseSEM. So, sem.coefs() does not show the output of all the interactions for the 2 categorical variables. Can you guid eme on how to extract all the coefficients? Also, I understand I can calculate the indirect effects by multiplying the standardised coefficients. Does having interactions in the model change this? And finally, how can I interpret the arrows on the sem.plot() function? Any help in the right direction will be really appreciated! Hi Jon, thanks for the nice work. I have been using piecewise SEM in manuscript I am near to submit. I write here because I have a quick question: is it possible to fix a sign of a relationship? For instance, I know that A and B are negative correlated, but when I run the model (which has several paths) the relationship between A and B becomes positive. Ecologically it is implausible to have a positive relationship between A and B. So, that is why I would like to make A and B with a fixed negative relationship. Hope I got my point clear. Again, many thanks for this very nice work! I am using the piecewiseSEM approach in my studies, and in a ms review, the referee suggested that the significance of the paths should be tested by bootstrapping and not with maximum likelihood estimators. Can I do this using piecewiseSEM? Thanks for your piecewiseSEM package, I am using it right now. However, there seem to be some problems about sem.coefs() function. As we I choose standardized coefficients(by setting standardize = “scale”), all the interaction terms are gone. However, when I do not choose standardized, I could see the output include interaction terms. Could you help to guide me how to extract the standardized coefficients of interaction terms? Please see some code and results below. Just have another problem during the use of piecewiseSEM. The modeling building is not an issue I think, but I can not get the AIC value and Fish’s C statistics. When using “sem.fit” function, I got the error “Error: All endogenous variables are conditionally dependent. Test of directed separation not possible!” See the code below, could you help try to specify where I did wrong? thanks very much. prtick & prmite are two kinds of parasites, and here the model trying to detect their competition and whether the competition is mediated by the environmental factors (NPC1,NPC2, they are PCA scores). prmite & prtick are the presence of parasite (0/1, binary). As my data involve in multiple sites, so I included site as the random factor. I add the interaction term because in the previous analysis we found that one kind of parasite was negatively correlated with the interaction between environments and the other parasite. Error: All endogenous variables are conditionally dependent. Test of directed separation not possible! I also hit an email to you, hope you could provide some advice. This error means you have no missing paths with which to construct goodness-of-fit tests. In other words, you have a fully saturated or just identified model. You could attempt to remove paths, but I recommend looking at the R^2 values of the individual models to gauge fit qualitatively. Thank you for developing the great package. I have waited for a package of SEM that can handle quantile regressions! While I analyze my data using piecewiseSEM now, I have noticed a small variance in the AIC output of sem.fit() when quantile regression is used in the model. Rerunning of sem.fit() on the same model shows a slightly different estimate. Here is an example using data(shiplay2013). The version of my R is 3.3.3 and piecewiseSEM 1.2.1. In cases of lm and glm, this seems not to occur. It is much appreciated if you would tell me why this occurs when quantile regression was used. Thank you in advance. Because the P-values for `rq` are obtained by bootstrapping they are slightly different each time. Hence the discrepancy! Congratulations for the piecewiseSEM package, it is really helpful. I have been using the first version and now I am with the 2.0. I started with this newer version because I got the error message :”Error: All endogenous variables are conditionally dependent. Test of directed separation not possible”. I read that someone else had that problem and you suggested to use the new version. I tried but could not make it run. I think I was successful when using psem function but when I tried to use “coefs” , “dsep” and “summary.psem” I get error messages (e.g. Error in FUN(newX[, i], …) : invalid ‘type’ (character) of argument for “coefs and “summary.psem”; and “data frame with 0 columns and 0 rows” when I try dsep). CO2 is a factor with two levels, AirTemp and Moist are continuous and Ring is the grouping factor. I could not find many documentation for these problems so I am directly asking to you. Maybe you could help to find what is going on. Hm can you contact me by email directly? Thanks! First of all, thank you very much for all the work you put into your piecewiseSEM package. It’s great and it opens up a lot of possibilities! I’ve got one question regarding it’s implementation. From what I’ve read, with classical ML methods (i.e. lavaan), centering variables is recommended, but standardizing them is not. However, when modelling individual GLMs, statisticians recommend centering and standardizing predictors in order to improve model performance and interpretability (e.g. Schielzeth, 2010; Harrison et al 2017). What’s the recommended procedure with piecewise SEM? It depends on what the centering and scaling is meant to accomplish. The standardized coefficients reported by lavaan and piecewiseSEM reflect centered and scaled data (try it and see! ), but centering and scaling may also be useful to reduce issues with multicollinearity. Centering and scaling, however, can defeat the purpose of using GLM if the data that are modeled using a non-Gaussian distribution (since centering and scaling means that the response no longer adheres to the properties of that distribution). Yes, it does. Thank you very much for the quick reply! It’s very kind of you! Any advice on how to get some information for the individual model fit for that binomial model? I do get pseudo R2s when I just run the lme models. Does piecewiseSEM support any other packages that can handle random effects, correlation structure and binomial responses? This package is just extraordinary. It is very simple to connect direct and inderect effects and test if the causal model will get accepted or not. I already used the piecewiseSEM package to fit a glmer with a random factor and several fixed factors, it worked perfectly. Now I’m trying to use a more simple linear mixed effect model (nlme package) with again one random effect and some inderect effects on the predictors of the first global model. Everything is working fine, I get the partial regression coefficents from the nice sem.coefs(piecewiseSEM) function, also the R2, but I do not get a p-value (it is always = 0), although the goodnes of fit test gives me a fisher C stats. I tried to increase and also decrease the model list complexity but it did not help. Do you have any solution? Thank you very much Jon! We run the analysis with different model set and included the missing paths and have now a reasonable Fisher’s C statistics of 0.98. First of all, thank you very much for the piecewise package! I am having trouble to understand when and how should I scale my variables. We are trying to use PiecewiseSEM because we have a lot of non normal dependent variables (some are beta-distribuited, some are lognormal). One of our goals is to state which independent variable (between a set possible variables) is more important to determine a dependent one. To do so, we expected to look at the standardized coefficients of the full model (as we normally interpret the selected models in the model selection approach) . Our first doubt was about how should we standardized our once dependent variable in those part of the model they are independent. While looking for the answer we found that many times, when variables are not normally distributed, the package does not standardizes it. So, our current doubts are: if we inform the function (scale = T), how should we interpret the coefficients in a model with a lot of non-normal dependent variables? Is it possible to compare coefficients between independent variables in models with non-normal distribution? When the variable is “acting” as independent, does it get scaled in the function but not when it is the dependent? Should we be trying to figure out the distribution of the scaled dependent variable and use it as our primary variable all along or should we include our variable as we have it (and inform the distribution that we have already decided) and let the function scales it? E(log-normal distributed) ~ C + D.
E_scaled(to be discovered distribution) ~ C_scaled + scale (D). Is it clear? If the first option is correct, then can we compare coefficients? Hi Jon! Thank you for your quick response! No need to be sorry! I get it now! Now I have another question: there is one variable that can be measured in different ways and conceptually we cannot choose between them, so we wish to choose between them analytically. Normally we would use the model selection approach and choose the measure included in the model with the smaller AIC (in a set of models that only differ in the used measure). From what I have learned about SEM/piecewiseSEM so far, it is only possible to compare nested models and them it would not be possible to create two models (one with the first option and another with te second option) and compare their coefficients or AIC, right? Do you have any suggestions on how could we choose our measure? Hi Jon! I thought I understood the thing about the scale argument, but now I’m not sure anymore. When we analyze multiple regression (doesn’t matter if they are normally distributed), we usually scale all independent variables and then we create the model using the scaled variables. Why it is not possible to do the same in a piecewiseSEM model (i.e. scaling all variables – including “dependent” variables – and then create the full model with the scaled variables)? Does the scale argument means something different than setting the same variation scale for all variables? I have a technical question about calculating d-separation using piecewiseSEM. I ran into this issue because I was getting different values when manually calculating the C-statistic for my own models. From what I understand, filter.exogenous() in piecewiseSEM filters out exogenous variables with no parents, because the direction of causality cannot be inferred from the model list. For example, if we fit a model based on the y-shaped model in Figure 3 above, x1 and x2 are both exogenous variables with no parents and would be removed by filter.exogenous(). However, doing this would involve leaving out one of the p-values used in the calculation of C.
Thanks for the quick reply! I’ll have to go back and read through Shipley (2000) to figure out whether exogenous variables “should” be included in calculating Fisher’s C, and then figure out the direction of causality that I should test. Thanks a lot for this amazing introduction to SEM. I am working on a simple SEM that includes one response variable and three explanatory variables. Given the small size of it, all variables are linked, leading to a fully saturated model. Dropping any link between variables would go against our ecological understanding of the system. I have been trying to figure out if using a fully saturated model is acceptable given that we can’t really test how well the model fits the data and I can’t really find a convincing answer either way. I am using your ‘piecewiseSEM’ package in R for my PhD research, and am worried that I likely have too many variables for the number of replicates I have. The model is running fine, passes the goodness-of-fit test, component models have decent marginal and conditional R^2 values, and several ‘significant’ paths. However, I only have 27 replicates and I am currently including 5 exogenous and 4 endogenous variables. In terms of the “d-rule”, does d = #endogenous variables + #exogenous variables? I can easily prune 1 endogenous variable and 2 exogenous variables if I am indeed violating the d-rule. I’ve search this error and also can’t seem to come to a clear consensus. Do you have any thoughts on what might be causing this? I’m having a hard time to understand coefficients and the relation between variables in the piecewise model when variables are not normally distributed. Can you help me out? In this case, I understand the direct effect A has on C is a, but how multiplying b*d express the indirect effect? Doesn’t it ignore the intercept of the first model or ignore the fact that d in the exponential term? If that way of concatenating the models is correct, then it is possible to write C in function of A (as it is done above, and it would possible to predict the value of C for a range of values of A and see the effect A has on C, but it would not be possible to know the indirect effect. Is the way I expressed the concatenated models correct? If so, is it still possible to multiply the coefficients as it is usually done in normal distributed SEM (d*b + a)? If it is not, how can I know the indirect effect? 1) Does piecewiseSEM handle multiple categorical predictors? and 3 response variables? 3) Is question #2 related to how I interpret the line types generated by 'sem.plot'? i.e., conditional effects vs interactions? 5) What is being reported by 'sem.coefs' when I have multiple variables and interactions included in each model in my model list passed to 'sem.fit'. I'm guessing my problem lies with the way I am specifying my models in my model list, i.e., strings of conditional responses greater than 1 and interactions. 1) Sort of. At the moment, the coefficients are returned but you will get errors. They will of course be relative to the reference level as well. We are working on an approach that returns marginal means for all levels of categorical predictors, but that is medium priority right now. 2) Without knowing your data or hypotheses, those are a LOT of interactions. I am most concerned about interactions between continuous and categorical variables. Depending on what the covariate d is, this is getting into multigroup model territory. We are also working on that implementation but have prioritized other aspects of the functionality right now. If you are interested in testing the differences among coefficients for each level of d and not specifically their interactions, drop me an email. 3) I would ignore that output, sorry, its just not a very functional. Plotting SEMs in R has always proven to be difficult. 5) The output is the raw (unstandardized coefficient), its standard error, d.f., significance value, and standardized coefficient. The default standardization for continuous variables is scaled by standard deviations of the mean. I imagine you get an error with the categorical interactions. Its not clear how and whether those ought to be standardized. Unfortunately you are hitting up against the bleeding edge of structural models. If you want to discuss options, again shoot me an email and we can hash it out. My question is about determining best model fit, specifically in the case where there is a covariate that has multiple buffer distances to choose between. In this case, my question relates to the covariate representing disturbance (PERDISTURB_5KM in the model above). Following methods described in Riginos and Grace (2008), I ran bivariate correlations between disturbance and noise for all the buffer distances that I had (800m, 1600m, 2000m, 5000m). The strongest correlation was between disturbance at 5km and noise, so I proceeded using that distance in all my SEM models. FYI, I selected PropSage800m distance based on best fit correlations with PopFactor. However, when I tested the model above and changed only disturbance at different buffer distances, the best overall model via lowest AIC and Fisher’s C was the model with disturbance at 800m, not the one at 5km. My question to you is which approach you recommend I take to determine best model fit: 1) based on individual correlation between disturbance and noise, 2) based on overall model fit via AIC and Fisher’s C or 3) A coauthor suggested I could test correlation between disturbance and the binomial response (PopFactor) to guide disturbance buffer distance selection. I’d greatly appreciate any thoughts on have on this model selection question. Thanks for this package! It´s usefull. I´m still on at work on an SEM and i am getting a value of P=1 and a Fisher=0. Should i understand this values like something is not working well? It´s infrequent get this extreme values, isn´t it? Its likely your model is just identified, meaning you have specified all possible linkages. Is this the case? Yes, it is the case. Now i will try to explain why i have to speciefied all possible links. If i run that structure, the values are P=0.052 and Fisher=5.89 on 2 degree of freedom with a missing path: X1->Y. Just there is the piont where i doubt about my model. When a get P=1, Fisher=0 on 0 degree of freedom. Thanks for all your work on a great package. I see from a previous post (from Kenji Yoshino, August 24, 2017) that version 1.2.1 was able to work with quantile regression (package ‘quantreg’). The current version of piecewiseSEM doesn’t seem to have that capacity. Do you have any plans to include this in any future versions? I’d love to be able to model quantiles rather than means. Thank you again for your package!! I was using the previous version and now I am trying to rerun the analysis in the new version, but I am getting some new error messages and I cannot find out what they mean. I was hopping you could help me. First, we have pretty complex models with different distributions and link-function within the model plus random factor. I have seen the new version is better prepared to deal with different link functions to test d-sep, but I am having trouble to use model with gaussian (logit) distribution + random factor. Whenever I use these two characteristics together, I get the following error after the summary(, conserve=T) command: Error in rsquared.glmerMod(i, method) : Unsupported family! I’ve done some tests and this error only occur with gaussian(logit) + random. I‘ve even tried to run binomial + random (just out of curiosity) and I get no error. Using the old commands from the first version works just fine. Do you have any ideia about what is happening or any recommendation? This seems to be some data.frame issue and I am clueless as to what does it means inside your package. This error appeared after I modified a very simple model: lmer(x ~ y1 + (1|random),data), by adding a new fixed continuous variable (y2). It has something to do with the random factor because if I exclude the radom factor, it runs just fine. Again, do you have any idea why this is happening? Any recommendation? In all tests I ran, when using the old functions (still available in the new package, but not recommended), I got no error message and whenever it was possible to compare results, I got the same results and coefficients values, but slightly different AIC and Fischer-C values (the same qualitative result, though). Does this mean anything? Could I use the old functions in these cases that I get these weird error messages? Since I am already writing to you, is there other ways to check for model fit besides AIC and FischerC in piecewise SEM? I know it is common in SEM to present multiple global fit metrics (X2, RMSEA, CFI…) and I’ve been asked to do the same in our model, but I can’t find if there is other applicable measures (besides local fit measures such as coefs, SE, pseudo-R2) to evaluate fit in piecewise.